The IDE’s GUI Builder makes it possible to build professional-looking GUIs without an intimate understanding of layout managers. You can lay out your forms by simply placing components where you want them. For descriptions of the GUI Builder’s visual feedback, you can use the GUI Builder Visual Feedback Legend. 1. Choose File > New Project. Alternately, you can click the New Project icon in the IDE toolbar. 2. In the Categories pane, select the Java node and in the Projects pane, choose Java Application. Click Next. 3. Enter ContactEditor in the Project Name field and specify the project location. 4. Leave the Use Dedicated Folder for Storing Libraries checkbox unselected. 5. Ensure that the Set as Main Project checkbox is selected and clear the Create Main Class field. 6. Click Finish. The IDE creates the ContactEditor folder on your system in the designated location. This folder contains all of the project’s associated files, including its Ant script, folders for storing sources and tests, and a folder for project-specific metadata. To view the project structure, use the IDE’s Files window. After creating the new application, you may have noticed that the Source Packages folder in the Projects window contains an empty <default package> node. To proceed with building our interface, we need to create a Java container within which we will place the other required GUI components. 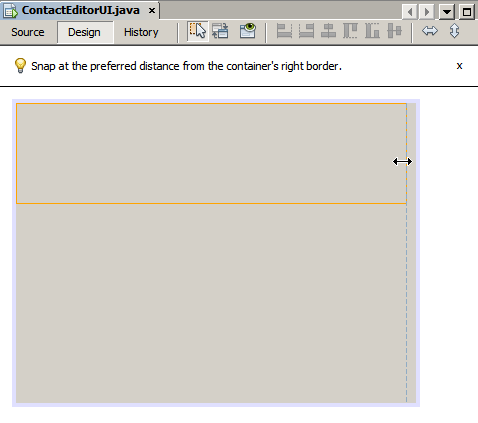 In this step we’ll create a container using the JFrame component and place the container in a new package. 1. 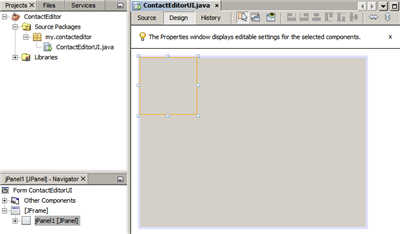 In the Projects window, right-click the ContactEditor node and choose New > JFrame Form. Alternatively, you can find a JFrame form by choosing New > Other > Swing GUI Forms > JFrame Form. 2. Enter ContactEditorUI as the Class Name. 3. Enter my.contacteditor as the package. 4. Click Finish. NOTE: To explore the GUI Builder interface with an interactive demo, view the link:http://bits.netbeans.org/media/quickstart-gui-explore.swf[+Exploring GUI Builder (.swf)+] screencast. When we added the JFrame container, the IDE opened the newly-created  ``ContactEditorUI``  form in an Editor tab with a toolbar containing several buttons, as shown in the preceding illustration. The ContactEditor form opened in the GUI Builder's Design view and three additional windows appeared automatically along the IDE's edges, enabling you to navigate, organize, and edit GUI forms as you build them. * *Design Area. 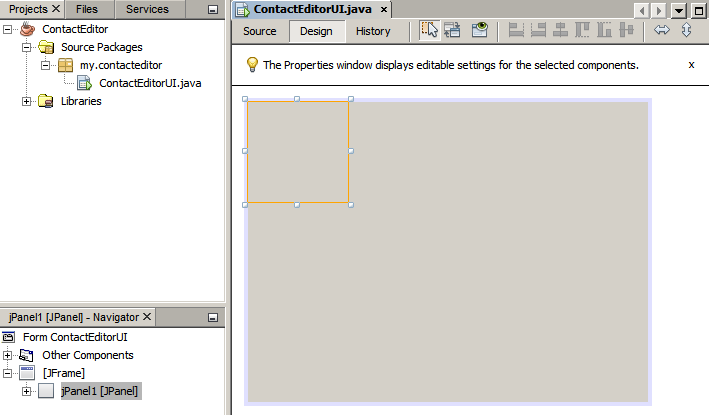 *The GUI Builder's primary window for creating and editing Java GUI forms. The toolbar's Source button enables you to view a class's source code, the Design button allows you to view a graphical view of the GUI components, the History button allows you to access the local history of changes of the file. The additional toolbar buttons provide convenient access to common commands, such as choosing between Selection and Connection modes, aligning components, setting component auto-resizing behavior, and previewing forms. * *Navigator. *Provides a representation of all the components, both visual and non-visual, in your application as a tree hierarchy. The Navigator also provides visual feedback about what component in the tree is currently being edited in the GUI Builder as well as allows you to organize components in the available panels. * *Palette. *A customizable list of available components containing tabs for JFC/Swing, AWT, and JavaBeans components, as well as layout managers. In addition, you can create, remove, and rearrange the categories displayed in the Palette using the customizer. * *Properties Window. *Displays the properties of the component currently selected in the GUI Builder, Navigator window, Projects window, or Files window. In the IDE’s GUI Builder, you can build your forms by simply putting components where you want them as though you were using absolute positioning. The GUI Builder figures out which layout attributes are required and then generates the code for you automatically. You need not concern yourself with insets, anchors, fills, and so forth. As you add components to a form, the GUI Builder provides visual feedback that assists in positioning components based on your operating system’s look and feel. The GUI Builder provides helpful inline hints and other visual feedback regarding where components should be placed on your form, automatically snapping components into position along guidelines. It makes these suggestions based on the positions of the components that have already been placed in the form, while allowing the padding to remain flexible such that different target look and feels render properly at runtime. Refer to the Adding individual and multiple components (.swf) screencast for an interactive demo on the section below. Though the IDE’s GUI Builder simplifies the process of creating Java GUIs, it is often helpful to sketch out the way you want your interface to look before beginning to lay it out. Many interface designers consider this a "best practice" technique, however, for the purposes of this tutorial you can simply peek at how our completed form should look by jumping ahead to the Previewing your GUI section. Since we’ve already added a JFrame as our form’s top-level container, the next step is to add a couple of JPanels which will enable us to cluster the components of our UI using titled borders. Refer to the following illustrations and notice the IDE’s "drag and drop" behavior when accomplishing this. 1. In the Palette window, select the Panel component from the Swing Containers category by clicking and releasing the mouse button. 2. Move the cursor to the upper left corner of the form in the GUI Builder. When the component is located near the container’s top and left edges, horizontal and vertical alignment guidelines appear indicating the preferred margins. Click in the form to place the JPanel in this location. The JPanel component appears in the ContactEditorUI form with orange highlighting signifying that it is selected. After releasing the mouse button, small indicators appear to show the component’s anchoring relationships and a corresponding JPanel node is displayed in the Navigator window, as shown in the following illustration. Next, we need to resize the JPanel to make room for the components we’ll place within it a little later, but let’s take a minute to point out another of the GUI Builder’s visualization features first. In order to do this we need to deselect the JPanel we just added. Because we haven’t added a title border yet, the panel disappears. Notice, however, that when you pass the cursor over the JPanel, its edges change to light gray so that its position can be clearly seen. You need only to click anywhere within the component to reselect it and cause the resize handles and anchoring indicators to reappear. 1. Select the JPanel you just added. The small square resize handles reappear around the component’s perimeter. 2. Click and hold the resize handle on the right edge of the JPanel and drag until the dotted alignment guideline appears near the form’s edge. 3. Release the resize handle to resize the component. The JPanel component is extended to span between the container’s left and right margins in accordance with the recommended offset, as shown in the following illustration. Now that we’ve added a panel to contain our UI’s Name information, we need to repeat the process to add another directly below the first for the E-mail information. Referring to the following illustrations, repeat the previous two tasks, paying attention to the GUI Builder’s suggested positioning. Notice that the suggested vertical spacing between the two JPanels is much narrower than that at the edges. Once you have added the second JPanel, resize it such that it fills the form’s remaining vertical space. Because we want to visually distinguish the functions in the upper and lower sections of our GUI, we need to add a border and title to each JPanel. First we’ll accomplish this using the Properties window and then we’ll try it using the pop-up menu. 1. Select the top JPanel in the GUI Builder. 2. In the Properties window, click the ellipsis button (…​) next to the Border property. 3. In the JPanel Border editor that appears, select the TitledBorder node in the Available Borders pane. 4. In the Properties pane below, enter Name for the Title property. 5. Click the ellipsis (…​) next to the Font property, select Bold for the Font Style, and enter 12 for the Size. Click OK to exit the dialogs. 6. Select the bottom JPanel and repeat steps 2 through 5, but this time right-click the JPanel and access the Properties window using the pop-up menu. Enter E-mail for the Title property. Now we need to start adding the components that will present the actual contact information in our contact list. 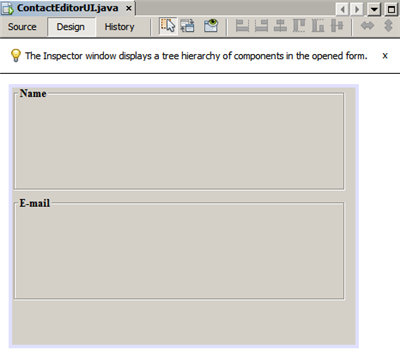 In this task we’ll add four JTextFields that will display the contact information and the JLabels that will describe them. While accomplishing this, notice the horizontal and vertical guidelines that the GUI Builder displays, suggesting the preferred component spacing as defined by your operating system’s look and feel. This ensures that your GUI is automatically rendered respecting the target operating system’s look and feel at runtime. 1. In the Palette window, select the Label component from the Swing Controls category. 2. Move the cursor over the Name JPanel we added earlier. When the guidelines appear indicating that the JLabel is positioned in the top left corner of the JPanel with a small margin at the top and left edges, click to place the label. 1. Double-click the JLabel to select its display text. 2. Type First Name: and press Enter. The JLabel’s new name is displayed and the component’s width adjusts as a result of the edit. Now we’ll add a JTextField so we can get a glimpse of the GUI Builder’s baseline alignment feature. 1. In the Palette window, select the Text Field component from the Swing Controls category. 2. Move the cursor immediately to the right of the First Name: JLabel we just added. When the horizontal guideline appears indicating that the JTextField’s baseline is aligned with that of the JLabel and the spacing between the two components is suggested with a vertical guideline, click to position the JTextField. The JTextField snaps into position in the form aligned with the JLabel’s baseline, as shown in the following illustration. Notice that the JLabel shifted downward slightly in order to align with the taller text field’s baseline. As usual, a node representing the component is added to the Navigator window. Before proceeding further, we need to add an additional JLabel and JTextField immediately to the right of those we just added, as shown in the following illustration. This time enter Last Name: as the JLabel’s display text and leave the JTextFields' placeholder text as it is for now. 1. Select the JTextField we just added to the right of the Last Name: JLabel. 2. Drag the JTextField’s right edge resize handle toward the right edge of the enclosing JPanel. 3. When the vertical alignment guidelines appear suggesting the margin between the text field and right edge of the JPanel, release the mouse button to resize the JTextField. The JTextField’s right edge snaps into alignment with the JPanel’s recommended edge margin, as shown in the following illustration. Now we’ll add the Title: and Nickname: JLabels that describe two JTextFields that we’re going to add in a minute. We’ll drag and drop the components while pressing the Shift key, to quickly add them to the form. While accomplishing this, again notice that the GUI Builder displays horizontal and vertical guidelines suggesting the preferred component spacing. 1. In the Palette window, select the Label component from the Swing Controls category by clicking and releasing the mouse button. 2. Move the cursor over the form directly below the First Name: JLabel we added earlier. When the guidelines appear indicating that the new JLabel’s left edge is aligned with that of the JLabel above and a small margin exists between them, shift-click to place the first JLabel. 3. While still pressing the Shift key, place another JLabel immediately to the right of the first. Make certain to release the Shift key prior to positioning the second JLabel. If you forget to release the Shift key prior to positioning the last JLabel, simply press the Escape key. Before moving on, we need to edit the JLabels' name so that we’ll be able to see the effect of the alignments we’ll set later. 1. Double-click the first JLabel to select its display text. 2. Type Title: and press Enter. 3. Repeat steps 1 and 2, entering Nickname: for the second JLabel’s name property. Refer to the Inserting components (.swf) screencast for an interactive demo on the section below. Often it is necessary to add a component between components that are already placed in a form. Whenever you add a component between two existing components, the GUI Builder automatically shifts them to make room for the new component. To demonstrate this, we’ll insert a JTextField between the JLabels we added previously, as shown in the following two illustrations. 1. In the Palette window, select the Text Field component from the Swing Controls category. 2. Move the cursor over the Title: and Nickname: JLabels on the second row such that the JTextField overlaps both and is aligned to their baselines. If you encounter difficulty positioning the new text field, you can snap it to the left guideline of the Nickname JLabel as shown in the first image below. 3. Click to place the JTextField between the Title: and Nickname: JLabels. We still need to add one additional JTextField to the form that will display each contact’s nickname on the right side of the form. 1. In the Palette window, select the Text Field component from the Swing category. 2. Move the cursor to the right of the Nickname label and click to place the text field. 1. Drag the resize handles of the Nickname: label’s JTextField you added in the previous task toward the right of the enclosing JPanel. 2. When the vertical alignment guidelines appear suggesting the margin between the text field and JPanel edges, release the mouse button to resize the JTextField. The JTextField’s right edge snaps into alignment with the JPanel’s recommended edge margin and the GUI Builder infers the appropriate resizing behavior. 3. Press Ctrl-S to save the file. Refer to the Aligning and anchoring components (.swf) screencast for an interactive demo on the sections below. Every time you add a component to a form, the GUI Builder effectively aligns them, as evidenced by the alignment guidelines that appear. It is sometimes necessary, however, to specify different relationships between groups of components as well. Earlier we added four JLabels that we need for our ContactEditor GUI, but we didn’t align them. Now we’ll align the two columns of JLabels so that their right edges line up. 1. Hold down the Ctrl key and click to select the First Name: and Title: JLabels on the left side of the form. 2. Click the Align Right in Column button (image::images/align_r.png) in the toolbar. Alternately, you can right-click either one and choose Align > Right in Column from the pop-up menu. 3. Repeat this for the Last Name: and Nickname: JLabels as well. Before we’re finished with the JTextFields we added earlier, we need to make sure that the two JTextFields we inserted between the JLabels are set to resize correctly. Unlike the two JTextFields that we stretched to the right edge of our form, inserted components' resizeability behavior isn’t automatically set. 1. Control-click the two inserted JTextField components to select them in the GUI Builder. 2. With both JTextFields selected, right-click either one of them and choose Auto Resizing > Horizontal from the pop-up menu. 1. Control-click all four of the JTextFields in the form to select them. 2. With the JTextFields selected, right-click any one of them and choose Set Same Size > Same Width from the pop-up menu. 1. In the Palette window, select the Label component from the Swing category. 2. Move the cursor below the First Name and Title JLabels on the left side of the JPanel. When the guideline appears indicating that the new JLabel’s right edge is aligned with the right edges of the component group above (the two JLabels), click to position the component. The JLabel snaps into a right-aligned position with the column of JLabels above, as shown in the following illustration. The GUI Builder updates the alignment status lines indicating the component’s spacing and anchoring relationships. Now we’ll add the combo box that will enable users to select the format of the information that our ContactEditor application will display. As we add the JComboBox, we’ll align its baseline to that of the JLabel’s text. Notice once again the baseline alignment guidelines that appear to assist us with the positioning. 1. In the Palette window, select the Combo Box component from the Swing Controls category. 2. Move the cursor immediately to the right of the JLabel we just added. When the horizontal guideline appears indicating that the JComboBox’s baseline is aligned with the baseline of the text in the JLabel and the spacing between the two components is suggested with a vertical guideline, click to position the combo box. The component snaps into a position aligned with the baseline of the text in the JLabel to its left, as shown in the following illustration. The GUI Builder displays status lines indicating the component’s spacing and anchoring relationships. 1. Select the ComboBox in the GUI Builder. 2. Drag the resize handle on the JComboBox’s right edge toward the right until the alignment guidelines appear suggesting the preferred offset between the JComboBox and JPanel edges. As shown in the following illustration, the JComboBox’s right edge snaps into alignment with the JPanel’s recommended edge margin and the component’s width is automatically set to resize with the form. [.feature] — image::images/06_align_3-small.png[role="left", link="images/06_align_3.png"] — 3. Press Ctrl-S to save the file. Editing component models is beyond the scope of this tutorial, so for the time being we’ll leave the JComboBox’s placeholder item list as it is. 1. In the Palette window, select the Label component from the Swing Controls category. 2. Move the cursor over the form immediately below the bottom JPanel’s E-mail title. When the guidelines appear indicating that it’s positioned in the top left corner of the JPanel with a small margin at the top and left edges, click to place the JLabel. 3. Double-click the JLabel to select its display text. Then type E-mail Address: and press Enter. 1. In the Palette window, select the Text Field component from the Swing Controls category. 2. Move the cursor immediately to the right of the E-mail Address label we just added. When the guidelines appear indicating that the JTextField’s baseline is aligned with the baseline of the text in the JLabel and the margin between the two components is suggested with a vertical guideline, click to position the text field. 3. Drag the resize handle of the JTextField toward the right of the enclosing JPanel until the alignment guidelines appear suggesting the offset between the JTextField and JPanel edges. The JTextField’s right edge snaps to the alignment guideline indicating the preferred margins. Now we need to add the JList that will display our ContactEditor’s entire contact list. 1. In the Palette window, select the List component from the Swing Controls category. 2. Move the cursor immediately below the E-mail Address JLabel we added earlier. When the guidelines appear indicating that the JList’s top and left edges are aligned with the preferred margins along the JPanel’s left edge and the JLabel above, click to position the JList. 3. Drag the JList’s right resize handle toward the right of the enclosing JPanel until the alignment guidelines appear indicating that it is the same width as the JTextField above. Refer to the Resizing and indenting components (.swf) screencast for an interactive demo on the sections below. It is often beneficial to set several related components, such as buttons in modal dialogues, to be the same size for visual consistency. To demonstrate this we’ll add four JButtons to our ContactEditor form that will allow us to add, edit, and remove individual entries from our contact list, as shown in the following illustrations. Afterwards, we’ll set the four buttons to be the same size so they can be easily recognized as offering related functionality. 1. In the Palette window, select the Button component from the Swing Controls category. 2. Move the JButton over the right edge of the E-mail Address JTextField in the lower JPanel. When the guidelines appear indicating that the JButton’s baseline and right edge are aligned with that of the JTextField, shift-click to place the first button along the JFrame’s right edge. The JTextField’s width shrinks to accommodate the JButton when you release the mouse button. 3. Move the cursor over the top right corner of the JList in the lower JPanel. When the guidelines appear indicating that the JButton’s top and right edges are aligned with that of the JList, shift-click to place the second button along the JFrame’s right edge. [.feature] — image::images/buttons_3-small.png[role="left", link="images/buttons_3.png"] — 4. Add two additional JButtons below the two we already added to create a column. Make certain to position the JButtons such that the suggested spacing is respected and consistent. If you forget to release the Shift key prior to positioning the last JButton, simply press the Escape key. [.feature] — image::images/buttons_4-small.png[role="left", link="images/buttons_4.png"] — 5. Set the display text for each JButton. (You can edit a button’s text by right-clicking the button and choosing Edit Text. Or you can click the button, pause, and then click again.) Enter Add for the top button, Edit for the second, Remove for the third, and As Default for the fourth. Now that the buttons are positioned where we want them, we’ll set the four buttons to be the same size for visual consistency as well as to clarify that they are related functionally. 1. Select all four JButtons by pressing the Control key while making your selection. 2. Right-click one of them and choose Same Size > Same Width from the pop-up menu. Often it is necessary to cluster multiple components under another component such that it is clear they belong to a group of related functions. One typical case, for example, is placing several related checkboxes below a common label. The GUI Builder enables you to accomplish indenting easily by providing special guidelines suggesting the preferred offset for your operating system’s look and feel. In this section we’ll add a few JRadioButtons below a JLabel that will allow users to customize the way the application displays data. Refer to the following illustrations while accomplishing this or click the View Demo link following the procedure to view an interactive demonstration. 1. Add a JLabel named Mail Format to the form below the JList. Make certain the label is left aligned with the JList above. 2. In the Palette window, select the Radio Button component from the Swing category. 3. Move the cursor below the JLabel that we just added. When the guidelines appear indicating that the JRadioButton’s left edge is aligned with that of the JLabel, move the JRadioButton slightly to the right until secondary indentation guidelines appear. Shift-click to place the first radio button. [.feature] — image::images/07_indent_1-small.png[role="left", link="images/07_indent_1.png"] — 4. Move the cursor to the right of the first JRadioButton. Shift-click to place the second and third JRadioButtons, being careful to respect the suggested component spacing. Make certain to release the Shift key prior to positioning the last JRadioButton. 5. Set the display text for each JRadioButton. (You can edit a button’s text by right-clicking the button and choosing Edit Text. Or you can click the button, pause, and then click again.) Enter HTML for the left radio button, Plain Text ` for the second, and `Custom for the third. Now we need to add the three JRadioButtons to a ButtonGroup to enable the expected toggle behavior in which only one radio button can be selected at a time. This will, in turn, ensure that our ContactEditor application’s contact information will be displayed in the mail format of our choosing. 1. In the Palette window, select the Button Group component from the Swing Controls category. 2. Click anywhere in the GUI Builder design area to add the ButtonGroup component to the form. Notice that the ButtonGroup does not appear in the form itself, however, it is visible in the Navigator’s Other Components area. 3. Select all three of the JRadioButtons in the form. 4. In the Properties window, choose buttonGroup1 from the buttonGroup property combo box. [.feature] — image::images/07_group-small.png[role="left", link="images/07_group.png"] — 5. Press Ctrl-S to save the file. Now we need to add the buttons that will enable users to confirm the information they enter for an individual contact and add it to the contact list or cancel, leaving the database unchanged. In this step, we’ll add the two required buttons and then edit them so that they appear the same size in our form even though their display text are different lengths. 1. If the lower JPanel is extended to the bottom edge of the JFrame form, drag the bottom edge of the JFrame down. This gives you space between the edge of the JFrame and the edge of the JPanel for your OK and Cancel buttons. 2. In the Palette window, select the Button component from the Swing Controls category. 3. Move the cursor over the form below the E-mail JPanel. When the guidelines appear indicating that the JButton’s right edge is aligned with the lower right corner of the JFrame, click to place the button. [.feature] — image::images/08_cancel-small.png[role="left", link="images/08_cancel.png"] — 4. Add another JButton to the left of the first, making certain to place it using the suggested spacing along the JFrame’s bottom edge. 5. Set the display text for each JButton. Enter OK for the left button and Cancel for right one. Notice that the width of the buttons changes to accommodate the new names. 6. Set the two JButtons to be the same size by selecting both, right-clicking either, and choosing Same Size > Same Width from the pop-up menu. [.feature] — image::images/08_same_size-small.png[role="left", link="images/08_same_size.png"] — The JButton components appear in the form and their corresponding nodes are displayed in the Navigator window. The JButton components' code is also added to the form’s source file which is visible in the Editor’s Source view. Each of the JButtons are set to the same size as the button with the longest name. 7. Press Ctrl-S to save the file. The last thing we need to do is delete the placeholder text in the various components. Note that while removing placeholder text after roughing out a form can be a helpful technique in avoiding problems with component alignments and anchoring relationships, most developers typically remove this text in the process of laying out their forms. As you go through the form, select and delete the placeholder text for each of the JTextFields. We’ll leave the placeholder items in both the JComboBox and JList for a later tutorial. Now that you have successfully built the ContactEditor GUI, you can try your interface to see the results. You can preview your form as you work by clicking the Preview Form button (image::images/test_form.png) in the GUI Builder's toolbar. The form opens in its own window, allowing you to test it prior to building and running. If you are running the IDE on JDK 5, the IDE automatically generates your application code to use the Swing Layout Extensions library. When you deploy the application, you need to include the Swing Layout Extensions library with the application. When you build the application (Build > Build Main Project), the IDE automatically provides a copy of the library's JAR file in the application's  ``dist/lib``  folder. The IDE also adds each of the JAR files that are in the  ``dist``  folder to the  ``Class-Path``  element in the application JAR file's  ``manifest.mf``  file. To run your application, right-click the project name and select Run in the context menu. In the Run Project dialog select the main class name ( ``my.contacteditor.ContactEditorUI``  if speaking about the project you have just created) and click OK. Your application is up and running. 1. Navigate to the project's  ``dist``  folder.